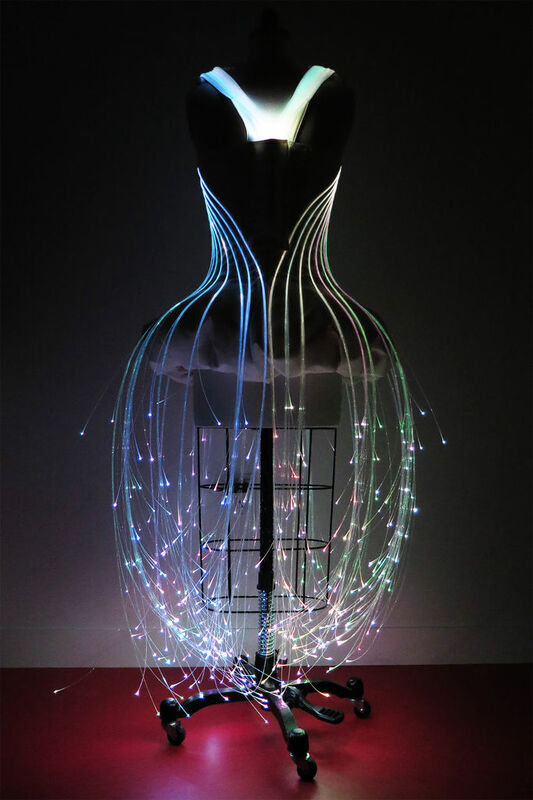 How to be a Fiber Optic Lamp #WearableWednesday « Adafruit Industries – Makers, hackers, artists, designers and engineers! If you want to resemble the coolest fiber optic lamp ever, you are going to have to get in line behind Natalie Walsh. She has created a mesmerizing flow of fiber optics. The balloon style underskirt encourages movement of the hanging fibers, which seem to shift color like melted sherbert. 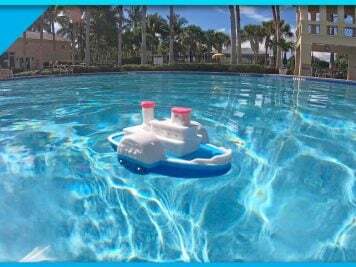 You can check out all the details (and challenges) in her Instructables. Fiber optics pose an interesting issue because they rely on a central light source, which means you have to allow room for this in the outfit. Natalie did a great job with her design. I designed the back to include a pouch for the handle, and the straps of the dress to bring the fiber optics from the center back to the front, and back around the body to an even distribution at the hips. In an odd way, working with fiber optics is a lot like dealing with a thick head of hair. You have to group all of the strands from one area, like a ponytail, and allow them to spread out in another. You can even trim them, much like you would for doing a layered haircut, to add interest. Natalie has some special suggestions for handling the light. Aside from just cutting the filaments, there are lots of options for making your fiber optics shine. As the light will escape wherever there is a cut or nick in the filament, distressing them with sandpaper, scissors, or simply natural wear and tear creates very cool effects. For this project I wanted to keep the light focused at the bottom, however depending on the look you are going for, it’s something fun to keep in mind! This is really an impressive dress, but it does take some time. Feeling inspired, but only have a few hours? 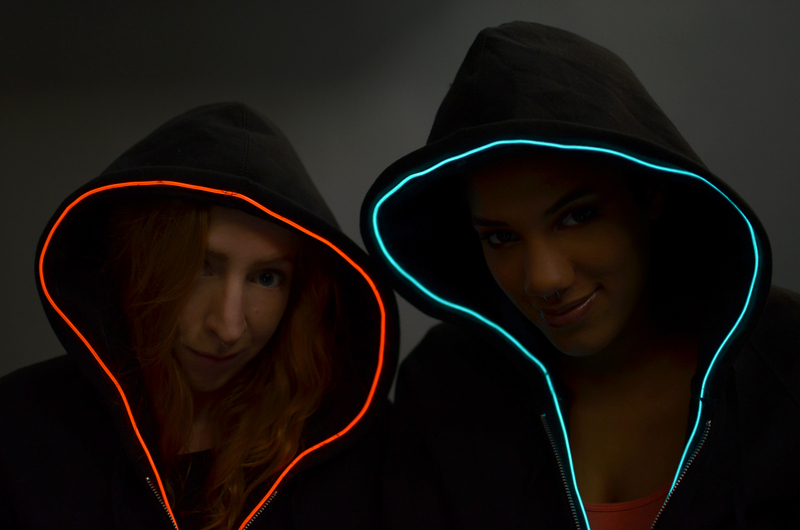 We’ve got a great Tron Hoodie tutorial waiting for you using El Wire. You can still look plugged in.